Feeling stuck in the muck of heavy energy? Lost your flow and feeling dry in seemingly everlasting ebb? I know how ya feel, and here is what helped me get out! I’ve been going on almost 10 days of stale energy. This ebb seems to be an unusual SUPER EBB. Normally, these energy ebbs come and go, and I am able to get a clear sense of the ways I can support myself through them (naps, exercise, breath work, doodling, more naps, and allowing the time to pass) and then gleefully slip back in to the flow of life and business. Here is what I came up with and I’m sharing this with you, well, frankly, because my Inner Whisper asked me to. While it feels somewhat private, I’m happy to share because maybe you are feeling a thick heavy energy and have a desire to release this. Write this post! I’d been feeling a creativity and writing block for these 10 days and the process of this post is FLOWING. I feel like me again. Using this exercise is a great way to show you that YOU and YOUR INNER WISDOM can be your best advisers at clearing your ebb and give you a chance to practice your own intuitive gifts. Since this is a listening and spirit exercise, remove all distractions and perhaps find a spot outside, near nature, or in your home that is clean and clutter free. Keep all technology- computers, mobile phones, even music out of this exercise. Next, sit down with a clean, large-enough pad of paper and a writing tool that feels good in your hand. Take a few deep clearing breaths and set the intention to tap into and hear what your body and Inner Whisper have to say to you. Now, draw a simple stick figure. Head. Body. Arms (don’t know why I was guided to put them in prayer position- maybe this whole exercise was an act of prayer). Legs. Hands. Feet. There is no right or wrong way to draw—just trust what comes to mind. Next, be sure your body is positioned comfortably and your feet are flat on the ground. Bring your awareness to your body and notice where you feel any tension or thickness. Where energy is blocked, our bodies often feel heavy, tight, or sometimes itchy. Trust your first reactions and avoid over-thinking. Your body will tell you. 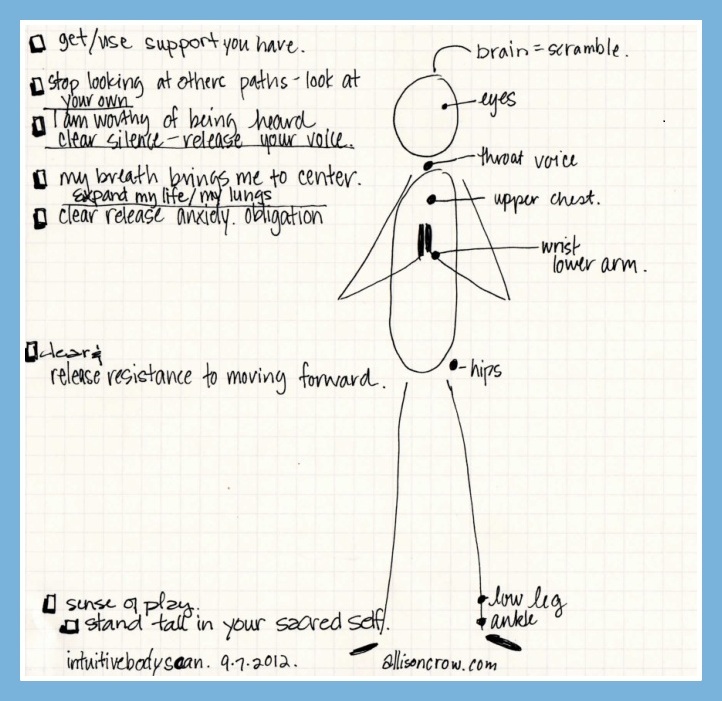 Place a mark on your stick figure and write that body part on your page as if you are labeling it. Scan your whole body and trust what comes up. You may have many areas; you may just have a few. Trust what comes up and note it on your page. Once you have your ‘body’ labeled, take a few more deep breaths. Maybe even send a thought of appreciation to your Inner Whisper for sharing this awareness with you. Now, go through each area, breathe in your heart, and ask your Inner Whisper, “What needs to be released or cleared?” and “Is there a message you want me to hear?” Write the very first thing that comes to your mind and trust the message you get. Make notes on your diagram. Lookie there! Yeah YOU! You have just completed your first intuitive body scan and energy clearing. How did it go? If you are new to “tapping in” be patient with yourself and keep practicing. Just like auditory listening is a skill that can be practiced, so is intuitive listening. I’d love to hear your thoughts and reactions. In the comment box, please let me know how it felt, and what this clearing does for you. Did you get any Ah-Has? Have you noticed any results? Let me know and feel free to share this exercise you know with someone you love! 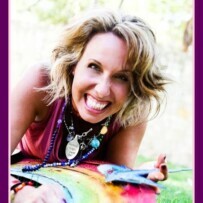 Allison Crow is an Intuitive Life & Business Coach who helps people get their lives and businesses SOUL-FULL! She is full of color, inspiration, wisdom, and spirit and adores alignment, authenticity, creativity, connection, & balance. Hop on over to http://www.allisoncrow.com and get your free Soul-Full Living Coaching Kit.